Miles is hoping Sara will share that ice cream cone with him. Joanne Johnson. We’re not talking Blue Seal, or Proplan, or even Solid Gold here. 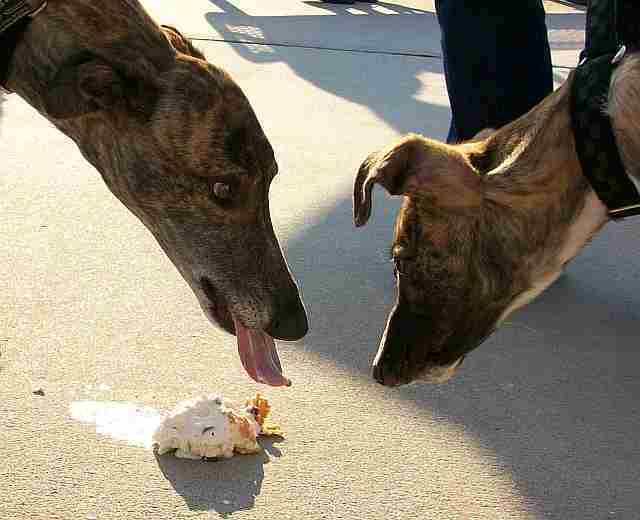 We’re talking about all those interesting, frequently non-nutritious things my greyhounds seem to find irresistible. Sometimes these specialty items are actually food. Tansy, that sweet, shy, and very proper lady, likes bananas. Not an occasional banana, but that bunch of 5 or 6 I have now and then neglected to put right away after grocery shopping. With skins, of course. I knew she had downed the whole hand because I found her lying on her mat with the heavy stem beside her, looking very pregnant. I was sure she would be sick, probably at both ends. Nothing happened, except that she belched once or twice during the evening. Barnaby, my food-a-holic male, who is anything but proper, swipes anything distantly related to food that’s been left on the kitchen counter. He especially likes raw white potatoes – and cantaloupe, whole – and bread, of course, though his real passion is butter or margarine. He likes coffee, cereal, the hearts of cabbage and cauliflower, apples, grapes, and just about anything else, although he’s sort of indifferent when it comes to celery. I’m vegetarian and spend lots of time chopping, slicing, and peeling stuff. At the first clunk of my Japanese vegetable knife on the cutting board, Tansy begins to vocalize, easily running up and down the scale (in the minor mode, usually) and becoming more and more insistent, ending with a high-pitched bark. The noise escalates until I share a little of whatever I’m preparing with her. Barnaby makes no noise but lies down behind me so that I fall over him as I move around collecting pots and ingredients. Both of them are happy to eat whatever is left from the preparation process: the woody stems of collards and kale, the ends of stringbeans, carrots, summer squash and lettuce. My kitchen floor is always covered with spots of drool and dropped goodies. (The dogs sometimes have trouble managing a mouthful of leafy things.) Any kind of fruit is always welcome, especially apples and grapes, and, obviously, bananas. They also like outdoor vegetation. Tansy regularly spends a part of her day eating lichen off the oak tree bark. Both have consumed all the berries from my cotoneaster bushes (the birds will be so disappointed) and occasionally sample the leaves from whatever annuals I’m growing. Barnaby also digs up and eats dirt. My back yard has many nose-shaped holes where he’s sampled the soil. Then there come the inedible items. Like video remotes – 3 of them, before I figured out that they had to be hidden in a tightly closed drawer. It must be the soupcon of battery acid that makes them so tangy. Tansy is the one with the abiding interest in plastic items. She has also consumed several CD jewel cases, trashing the CDs in the process. Barnaby tends to prefer things with significant calories, but he, too, enjoys a nice bouncy piece of plastic for gnawing. Cat food cans are another one of his favorite chewies. Wood is another favorite thing. Outside it’s usually just a chunk of fallen branch (lots of those in my woodsy yard). Inside there are table legs, or the corner of a bench. Tansy has done significant damage to one of my end tables, but Barnaby went her one better and seriously chewed the end of my kitchen counter. Sterile marrow bones filled with cheese or peanut butter have proven to be a useful form of distraction. If the peanut butter is cold and firm, it can take at least an hour of licking to get it all. I’m trying to find other jobs for these dogs to do, too, as a way of distracting them from CD’s, remotes, and table legs. Tansy collects footwear – doesn’t chew on the slippers and shoes, just collects them. Barnaby does the same but forgets himself now and then and nibbles on the edges of whatever’s on the floor. (Given his size, nothing Barnaby does with his mouth could be called a nibble.) He likes well-worn sneakers the best, I guess, because they have that wonderful lived-in smell. The damage has lessened over the past year. I’ve learned to hide things and the dogs have discovered that tearing up used facial tissues or wet paper towels can be almost as much fun as demolishing video remotes. I suppose that’s progress of some sort. I feel fortunate that none of these eating misadventures has resulted in a vet visit or, worse, surgery, although I did have to call the poison control center on the Sunday that Barnaby ate an ant trap. (Yummy plastic, again.) I was assured that the brand he ate would not hurt him, but I admit to being very frightened about that particular diet supplement. Part of the problem here, I realize, is that I find it hard to scold the miscreants. That “who, me?” look gets me every time. At the very least, I’m learning to be a tidier housekeeper. And the hounds are having so much fun. Please be careful with grapes, they are toxic to dogs and can damage the kidneys. I just learned recently myself, I had been giving my boy broccoli and avacado(thankfully only small amounts) and the articles say that’s not very good either. My younger grey, Doby, will try almost anything. I grew a bumper crop of snowpeas the same year I got him. We would go out everyday and munch on them right off the vine. I would pick one for me, one for Doby. He quickly learned to pick them for himself. One of his favorites is brocolii stalks. A friend suggested it as a good chew toy. He gobbles them down in about 15 minutes. Yum! Any kind of fruit (with cherries, it’s pits and all). My kids are pretty good about the counter surfing – they’ll smell what I have there but won’t take it unless I leave the room for more than a half hour. Even then, theyr’e pretty good about it. Grocery bags are fasinating! Long noses must check each one to see if there are any toys – then Doby will take it (he just assumes it’s his) to his bed. Cammie, a 12 year old former racer/breeder who didn’t get to ‘retire’ until she was 9, is quite the lady. She’ll wait unitl I hand her something to eat it and is very, very fincky. No fruit or veggies (unless cooked) for her royal tummy.